Today: An old-school American snack cake gets a little modern bling. This Memorial Day, other people might be excited for the lazy backyard barbecues, or splashing around at the beach. Those sound fun. But seriously, we're in it for the buckle. 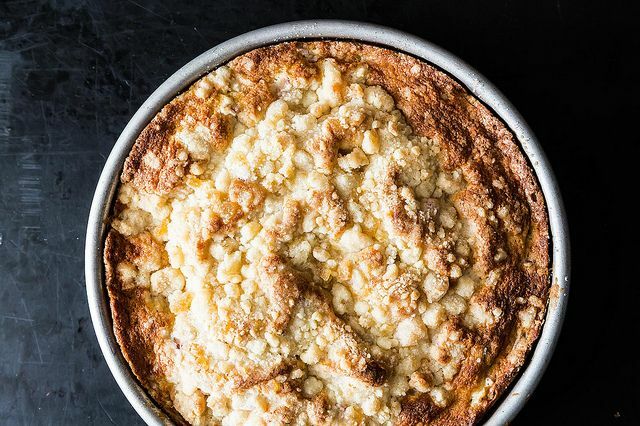 This is that time of year you can raid your local farmers market or roadside stand in the morning, and an hour later be staring at a cake-like thing heaving with fruit, willing it to cool. 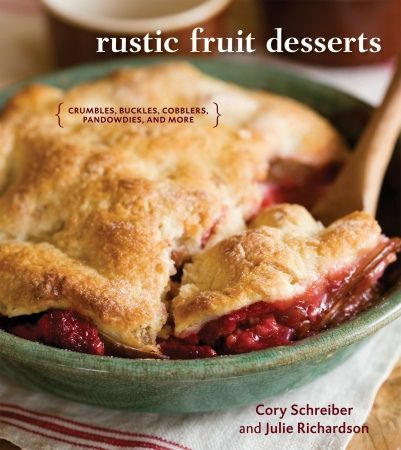 So this is the book you want to keep on a convenient shelf in the kitchen all season: Rustic Fruit Desserts, from Portland chefs Cory Schreiber and Julie Richardson. It has all the grunts and slumps and pandowdies you'll need, and you don't even have to worry what those names actually mean. They're relics of our sweet American past, and there's little point in trying to neatly categorize them, although we try. All we need to know is that they're snack cakes -- sweet dough wrapped around seasonal fruit, in all manner of glorious, lumpy guises. 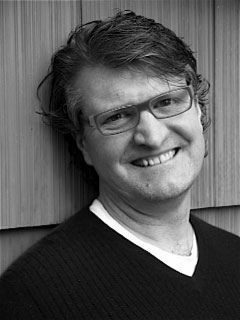 They resist definition -- they sprouted up regionally, so your grandmother's buckle is not Martha Stewart's. More: Another genius destination for rhubarb? 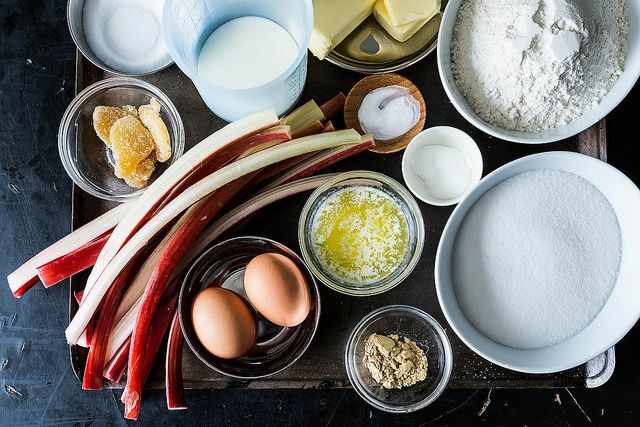 Straight-Up Rhubarb Pie. But I can tell you about this buckle, sent my way by Food52er Fairmount_market. 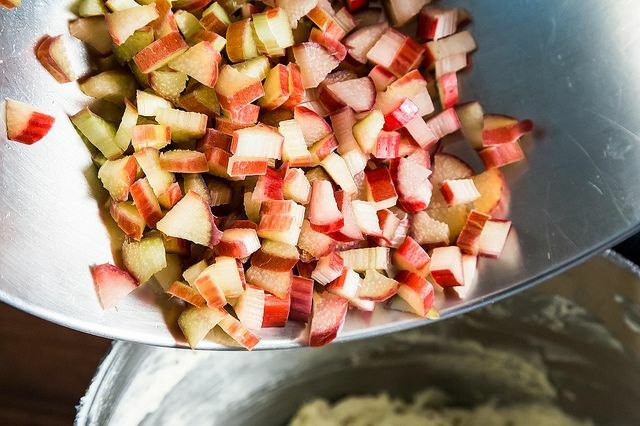 You make a thick buttermilk batter, fold in sliced rhubarb, and shower it with a frozen, sugary crumb. 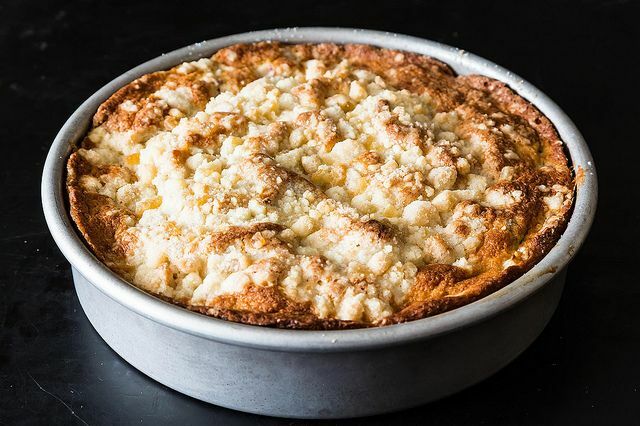 As it bakes, the rhubarb bleeds into downy cake, and a golden crust puffs and then dips under the weight of the craggy crumb top (okay, it buckles -- happy now?). 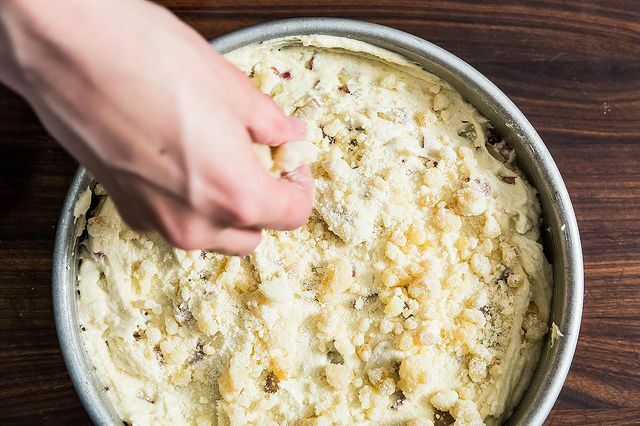 "A crucial step is to be sure the crumb topping is completely frozen before scattering on the cake and doing so right before placing the cake in the oven," Richardson told me. "Otherwise the crumb melts into the cake and although tasty, it just doesn't look as spectacular!" 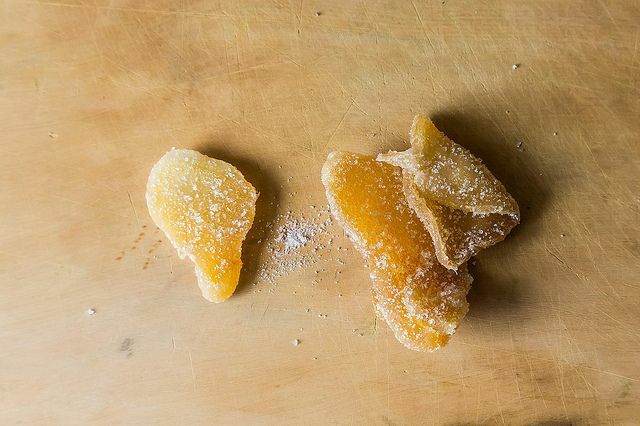 It would be a pretty perfect recipe at that, but the clever Schreiber-Richardson team snuck in a secret ingredient: ginger (times two). 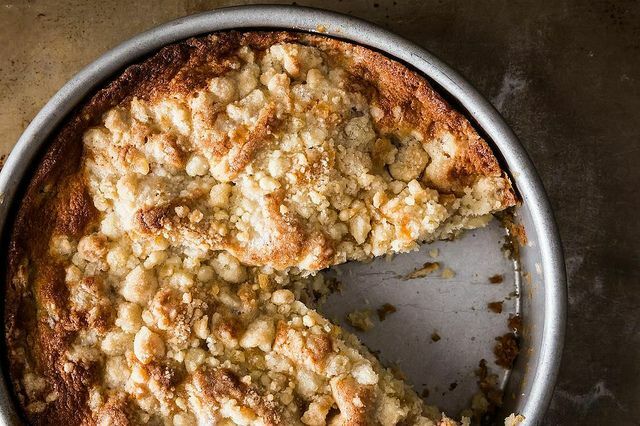 There's fiery candied ginger minced up in the crumb topping, and ground ginger in the cake too -- just enough to give it a warm, flirty je ne sais quoi that doesn't try to shout over the rhubarb. Just absolutely delicious with freshly picked rhubarb from our garden. I made two: one with butter and almond milk and the other with coconut oil and almond milk. both delicious. The candied ginger on top was the best! Well, I am admittedly a lousy baker. I thought trying a "genius" recipe might change my reputation! Mistake number one...I used frozen rhubarb. I thawed it, but tried squeezing out most of the water for fear of soggy cake syndrome (bye bye texture and taste) and then (mistake number two)I put it into an 8 inch springform!! Definitely added 20 more minutes (and 3 inches in height!!) to the baking process. Given the extra time for the center to cook the ginger pieces over browned and were bitter. After removing the darker ginger pieces, I did plate it up and serve it at a brunch and amazingly it disappeared! I will certainly make it again, minus my faux pas! We all loved this but would reduce the ginger a bit next time around. Tried this the other night. What a success! The topping is deliciously crunchy and chewy - the freezer trick works! I was worried the rhubarb would make it batter rather wet but no it turned out to have a cake like texture. Brilliant with creme fraiche. The rest never made it to the freezer. This IS truly a genius recipe and the book is a treasure! Every recipe I've ever made from it is a keeper. For this one, I added about a cup of quartered strawberries and reduced the rhubarb a bit. Can't beat the strawberry rhubarb combo! so what makes a buckle a buckle, if you don't mind my asking ? This is what the authors of Rustic Fruit Desserts, who created this delicious recipe, have to say about a buckle: "A buckle has a cake batter poured in a single layer with berries added to the batter. It is often made with blueberries because the berries sink yet keep their shape in the batter. Once baked, the cake has a "buckled" appearance. Think of a buckle as halfway between a cake and a fruit crisp. Buckles are great for breakfast!" I concur -- I had this cake with my morning coffee today, so good! This recipe is the reason I bought the book. So delicious and moist, I was worried the rhubarb would not cook enough but it did, I was also worried it would not be sweet enough, but it was. It deserves to be in this category. Had it tonight with creme anglais, took me right back to my British childhood. I'm so pleased to see this recipe featured! I already had plans to make it this weekend. Wow, this looks like my ideal dessert/snack. Can't wait until our rhubarb plants get a little bigger. This will definitely be on the list of what to make! 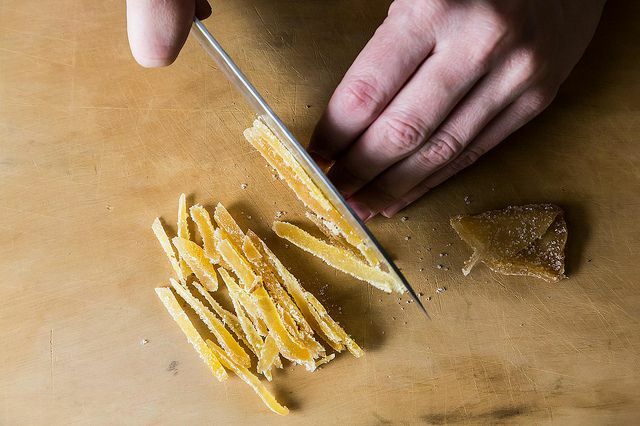 So glad to see these two talented chefs featured in this column. I have this cookbook and it is one of my favorites. I use it frequently through the summer and autumn months when there is such an amazing bounty of fresh fruit available. I haven't tried this buckle yet, but I have some rhubarb in the refrigerator with this recipe's name on it! This cake looks divine with the double addition of ginger and that beautiful crumb topping. 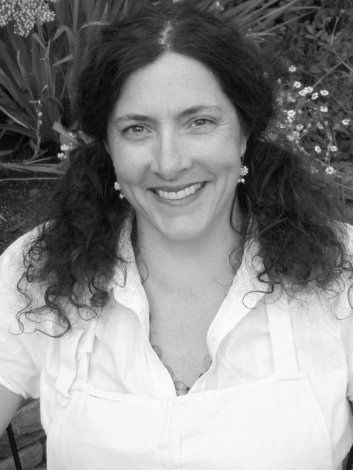 Thanks so much Kristin and Fairmount_market! Love buckles in general -- this version looks so delightful. 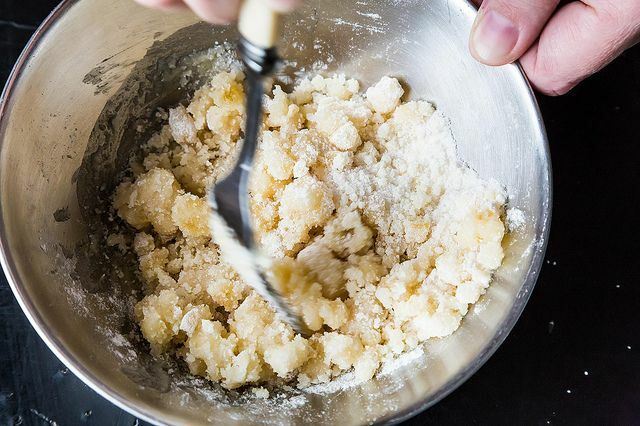 The part about freezing the crumb topping is so smart. Can't wait to try it. This looks utterly delicious. Enchanted by the rhubarb/ginger idea! Thanks!! 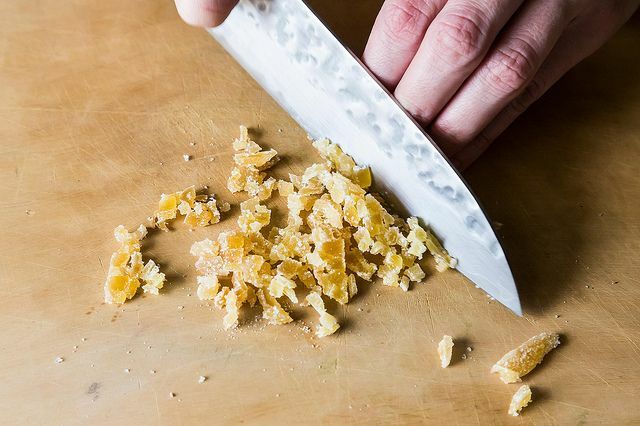 Oh this is so good -- I love the candied ginger. Also the crumbs in that first photo look like Milk Bar milk crumbs! Thanks Kristen and FM! I've some rhubarb in the fridge just waiting to be buckled, and this book sounds right up my alley. I'm desperate to try this!!! !